Obsession starts small and then tightens its grip, threatening to strangle resistance. The more we try to wriggle free, the greater the hold. Kinda like a gila monster. Baby Chicken spent her sixth year fueled by a search for the elusive lizard known as Gila. She, fascinated by the strange creature, spent time in the desert hoping for one to just pop into view for her observation. As the mama at her side, my worry was that her tiny fingers would reach out for a touch and the monster’s famous grip would refuse to loose and I would be carrying my child through the desert, gila monster firmly attached to her pointer. Gila monsters have a jaw that locks once they grab hold. The stuff of nightmares. Akin to obsession, non? The latest grip–a new project that remains top secret. Let’s just say this: It involves cats. And dogs. And horses and other fur babes. And a badass chick that has the vision. The problem? This girl, lover of pearls, sheath dresses and heels higher than most people’s standards, feels a need to don overalls and frolic in the grass surrounded by fur creatures. Yeah—whaaa? No lie. Is it wanderlust? Is it subconscious telling me to stop work and worry and take a break? Is it photos of wet, terrified, wild-eyed little ones being rescued from Houston’s flood waters? 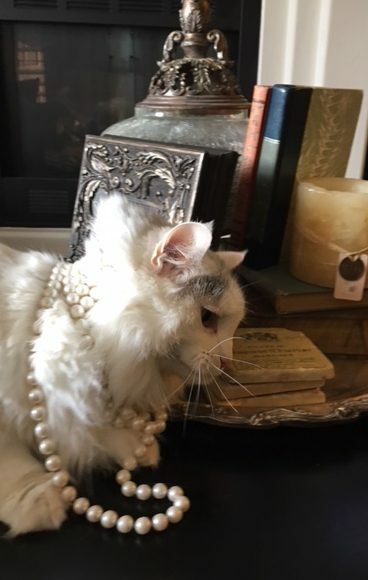 Or could it be the recognition that if more than Peeka, the little white cat and Tommy Bahama, the skittish tabby, inhabited this girl’s home, Crazy Cat Lady would become more than moniker. It would become fact. Thus the grassy open space, the overalls and embraceable furry friends. The thought won’t loose its grip. It begins with an invitation to the group that cares for the Salt River Wild Horses. I’m asked to listen and learn. Instead, their plight haunts. From there is examination of the plight of animals all around us. Kittens swimming in filthy flood waters and dog eyes pleading for help perched on roofs and car tops fill both dreams and waking hours. So the project? A badass chick I know. Animals galore. Change the world. Simple right? As simple as trading in pearls and heels for overalls and kittens? Well, maybe for one day a week. The obsession hasn’t hit gila monster level. Yet. 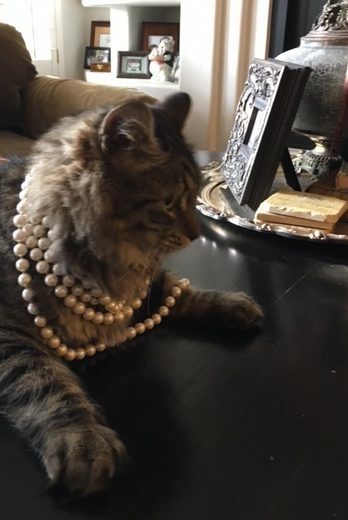 But…kittens in pearls? Who could resist?